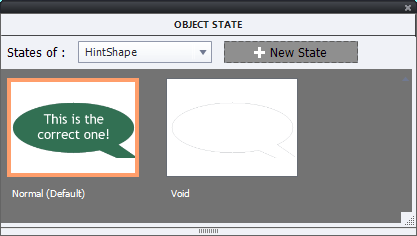 Recently in this thread user asked how to control the appearance of a hint caption. It was meant to save some frustrations to the learner: hint should appear automatically after some seconds (to be defined), but should not appear when the learner had performed a certain action before that time. This is clearly not possible with the inbuilt Hint messages for interactive buttons. They only appear when the learner is approaching the place where he should click. A custom solution needed to be found. Three solutions were posted, interesting to have a look and compare them. Personally I always bear in mind that someone would like to use this workflow in a fluid boxes responsive project, and that limits the possibilities because stacking is not allowed in normal fluid boxes. We have multistate objects and since a couple of versions a “Delay Next actions….” command. You will see two slides where a Hint can appear if you are not successful within a delay: slide 2 (arrows) and the Drag&Drop slide (3). I used an almost identical workflow for both slides with a Shared Action triggered with the On Enter Slide event, and a simple advanced action triggered by the arrows (slide 2) or by the object actions (slide 3). Both slides have a hint which is a multistate shape. No variables were used. Slides 4 and 5 show the used actions. If you prefer to watch the rescalable version, use this link. Apply an effect (I used an emphasize effect). TIP: although both slides 2 and 3 are pausing at 1,5secs (default pausing point), the command ‘Delay Next Actions by…. ‘ will NOT be paused, timer just continues. That behavior is a big advantage for this particular use case! It would have been possible to use a simple action in this case, but the advantage of an advanced action was that I could assign it in one workflow to all the arrows on this slide. What is the purpose of the Continue command? An advanced action will not release the playhead automatically as is possible with a simple action. On slide 2 a Next button has been added, with a timeline starting after the pausing point of the Arrow shapes acting as buttons. Release of the playhead is necessary to make the Next button visible. It has been assigned to the 4 possible Object Actions in that dialog box, which you find in the Properties panel for the Drop target, under the Format tab. 'Object Actions'.